After going into orbit around Jupiter, Europa Clipper is being designed to make over forty flybys of the moon during its nominal mission. Occurring as frequently as two weeks apart, the passes will allow the spacecraft to do detailed scans of Europa looking for evidence of possible habitability and scout the surface for potential landing sites for a future spacecraft. The Europa Clipper project is nearing its Preliminary Design Review (PDR) in August. The spacecraft design is now working to a “not to exceed” mass of six metric tons. “The flight system is on strict orders to not exceed a very precise total mass, namely 6001 kg,” Brent Buffington and Jason Kastner of NASA’s Jet Propulsion Laboratory wrote in the March 2018 issue of “The Sextant,” a Europa Clipper newsletter. There are four three-week long launch opportunities bracketed by the different policy positions from 2022 through 2025. Congress maintains the language that NASA must plan to launch Europa Clipper by 2022 and have continued to provide higher annual funding for it, but both the Obama and Trump Administrations have proposed later launch dates (and less money) while still signing bills into law with the earlier date. 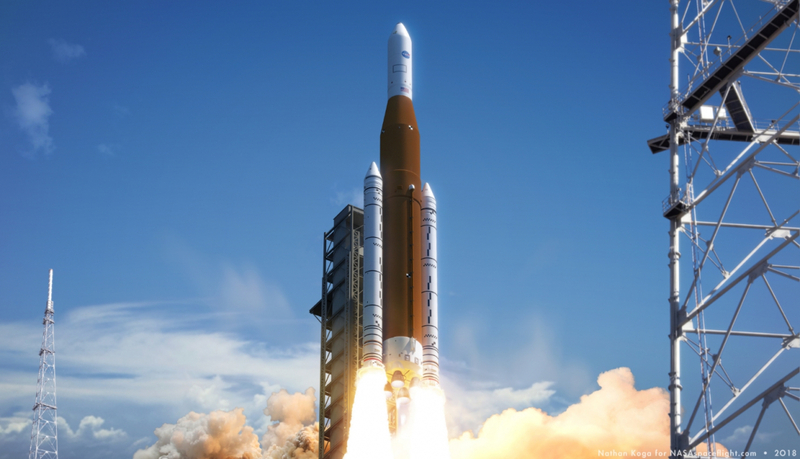 The Trump Administration favored a 2025 launch date on a commercial launch vehicle in their submitted FY 2019 budget request. The Congressional mandates and money are intended to start Europa Clipper’s science mission as soon as possible by launching sooner and getting to Jupiter faster. The Block 1B vehicle had extra margin to fly a payload the size of Europa Clipper directly to Jupiter; but EUS and Block 1B were not likely to be ready for the first opportunity in 2022 even before Washington funded ML-2. In the wake of ML-2 funding and the change in direction, NASA began looking at “Jupiter Direct” trajectories with Block 1 again. “NASA’s early analyses of launch windows for Europa Clipper in 2022, 2023, 2024, or 2025 indicate that direct trajectories are feasible for SLS Block 1. Further analyses are expected to confirm these early findings with the possibility of some minor configuration modifications,” Hambleton noted in her email. “Each window can support a mass for Europa Clipper of at least 6 metric tons,” she added. Analysis of Block 1 options increased as discussions about the second mobile launcher increased last year. “SLS has been working closely with the Europa Clipper program for some time. The referenced assessments are fairly recent from winter of 2017/2018, and are part of on-going analyses that continue to mature,” Hambleton said. The characteristic energy (C3) required for Jupiter Direct trajectories varies within launch opportunities and between them. “We have been looking at direct trajectories to Jupiter for the early to mid 2020’s. 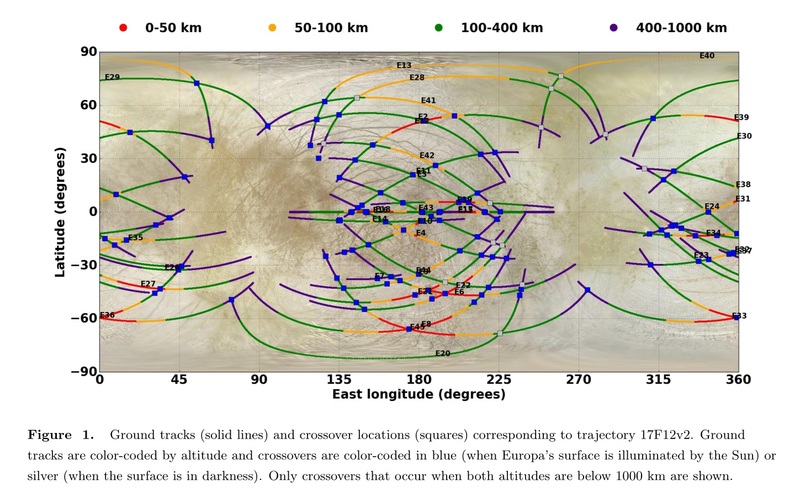 The C-3 for a direct trajectory to Jupiter ranges from about 78-82 depending on the launch date for opportunities between 2022-2025,” Barry Goldstein, Europa Clipper Project Manager for NASA, wrote in an email. If it is to fly on SLS, Europa Clipper would ride on the 10500 Block 1 Cargo vehicle; instead of the Orion spacecraft in its launch configuration with a launch abort system and stage adapter above and below, the planetary spacecraft would sit on a payload attach fitting encapsulated in a 5-meter (5m) diameter fairing bolted to the ICPS. SLS Block 1 launches a cargo mission — perhaps Europa Clipper — using the 5m Delta IV PLF with ICPS. Credit: Nathan Koga for NSF/L2. 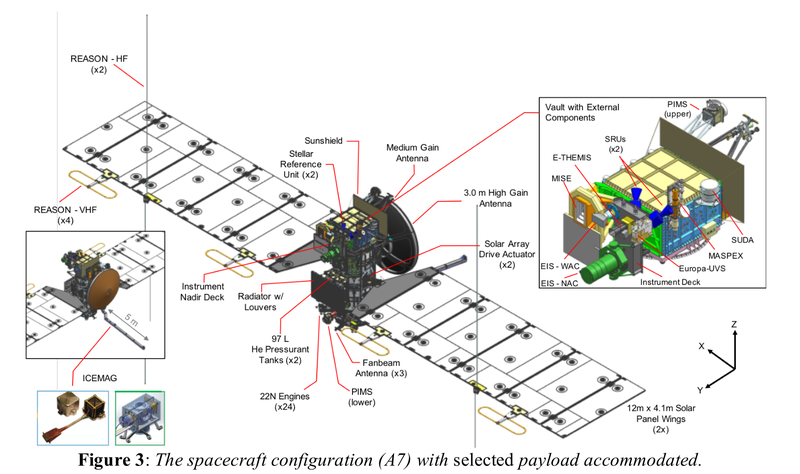 Prior to the formal “stop work” notice on post EM-1 Block 1 missions in 2016, earlier work on cargo configuration offerings studied using commercial 5m fairings. 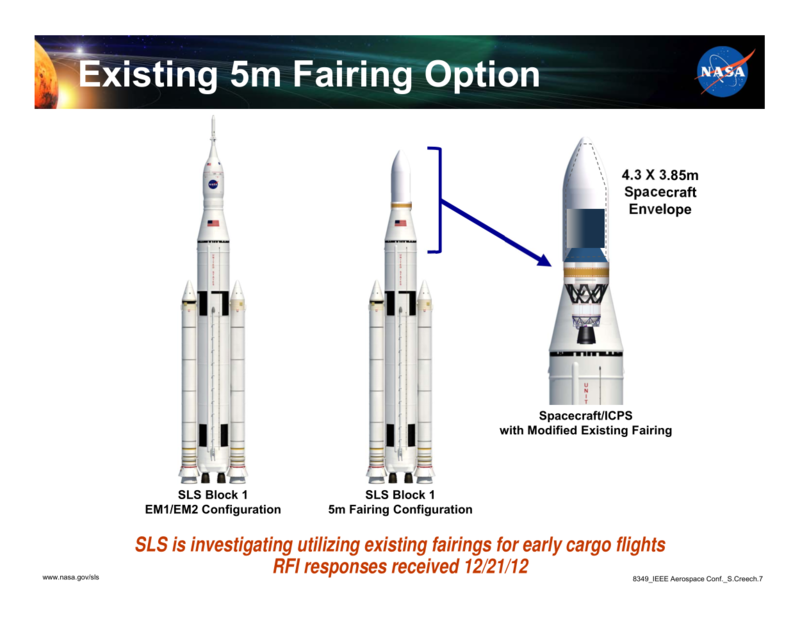 Shorting after ML-2 was funded, NASA highlighted the option of a fairing used by Delta 4 Heavy vehicles. 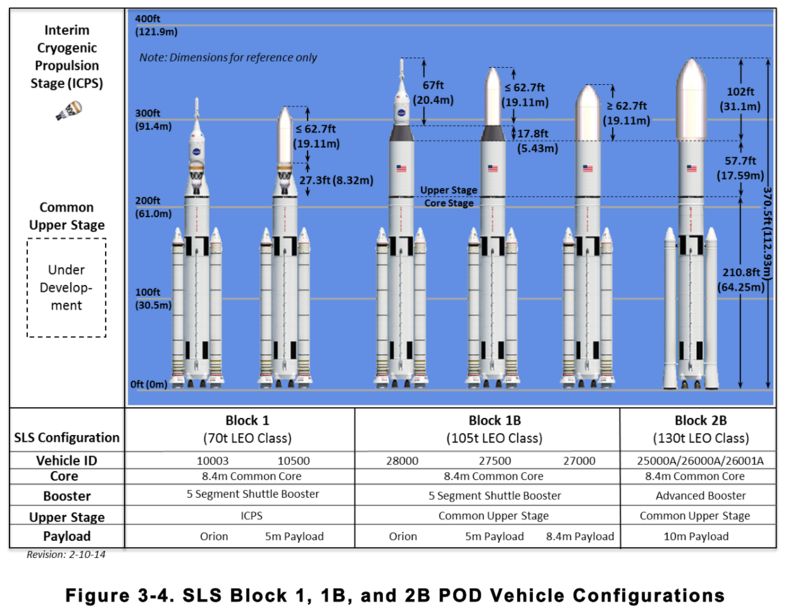 “The corresponding SLS Block 1 cargo configuration can deliver 5m class Primary Payloads and optional SPL using Commercially Off the Shelf (COTS) Payload Fairings such as the Delta IV 5.1m diameter by 19.1m long composite fairing,” an RFI published last month noted. Although NASA will have to human rate the ICPS before crews can fly Orion missions on top of it, there doesn’t appear to be similar type of forward work for uncrewed launches. “NASA has not identified any additional qualification/certification at this time beyond mission specific planning and analysis for ICPS to fly Europa Clipper,” Kathryn Hambleton said in her email. Preliminary planning for an SLS launch called the flight Science Mission-1 (SM-1), to distinguish it from the Orion Exploration Missions, but more recently references to a “Cargo Mission-1” (CM-1) name have also been seen. As with Block 1 mission profiles for Orion, the Boosters and Core Stage would fly to an elliptical insertion orbit to maximize performance while still allowing safe disposal of the Core; for a cargo mission like Europa Clipper, they could go beyond the 975 nautical mile apogee for Orion at insertion by the Core Stage. After a short burn to make perigee orbital, the ICPS would then make the large, Trans-Jovian Injection burn to send Europa Clipper on its way to Jupiter. “The Europa Clipper spacecraft is expected to be separated from the ICPS within about 3 hours after liftoff,” Anderson noted.